By the time they pulled into the airport parking lot to pick up her sister for Christmas, it was well past midnight, and the snow was falling heavily over Alaska. Mina leaned towards her car window and blew gently on the surface, watching with wonder as the glass clouded over. Heat transfer, she thought, frowning. Chemistry class didn’t quite make sense to her yet. She was in her first year of high school, and the novelty was beginning to wear off, like it always did. Eighth grade became just another year of tests and schoolyard gossip. Warm breath on her window became condensation, became water molecules. Her first year free of her older sister’s influence became her first year of being alone in a house too large for three. “Her plane’s going to be delayed, in this weather,” her father was saying as he shut off the engine. Mina tuned out as her parents lapsed into an argument over plane routes and snowfall and the distance from Montreal, Quebec. From where her older sister had been living for four months in university, on her own. It had been weird for Mina, catching up on her own sister’s life through snatches – status updates about studying, blurry photos in which she wore eyeliner and looked grown-up, the odd text message: take care of mom and dad. The last time Mina had heard her voice was on her birthday, when she’d left a hurried voicemail message. “Save me some cake,” she’d joked. The next morning Mina ate it all. It had made her feel sick. “You never listen to anything I say,” Mina’s mother snapped, jolting her back to the present. The car was growing colder, but her parents made no move to exit the car, and Mina sighed. The parking lot was thick with snow, crowded with empty vehicles, lit up by the dull glow of the streetlamps. Through the window, she could see a newly reunited family bundling into their minivan, rosy-cheeked and smiling, their laughter and loud chatter muffled through the glass. Mina looked away. “That’s rich, coming from you,” her father hissed. Ever since Mina’s sister had left for university, her parents had fallen a little too easily into this new routine of relentless arguing. It had started with uncomfortable silences, then offhand comments – the spaghetti was too cold, or they’d forgotten to buy milk, or the heating bill had gone up. Sharp rebuttals edged into raised voices, into shouting matches, until Mina was left wishing for the silence once again. Wishing for the father who taught her pre-calculus over the dinner table, for the mother who used to save her the ripest strawberries from the garden in their backyard. But their garden hadn’t grown plants in years. Alaska was too cold, and sometimes to Mina it felt like the winter would never end. That was when she saw it. Squinting, Mina rubbed at the glass of her window, pressing her forehead against the cold glass. Up above, the sky was clear, though studded with stars, but beyond that was something even more brilliant. Swirls of colours were splayed out across the night sky, setting the darkness ablaze. A memory suddenly rose up inside her, and Mina paused, remembering the first time she’d seen the Northern Lights. She’d been a young child, barely tall enough to see out the window, and it had been her sister who’d hoisted her up in her own arms to allow her a better look. Back then, Mina had been enthralled, enchanted. It had looked like magic. Like a miracle. Her sister had laughed, putting her down, explaining: “Aurora borealis.” It had sounded like science. Mina had felt disappointed. Now, Mina looked back at her parents, whose argument had faded into a sullen silence. She watched them in the rearview mirror, noticed the way her father stole a quick glance at her mother when she had her face turned away, and how her mother kept looking at him out of the corner of her eye, but never when he was looking back. The space between the two of them, shifting, and the way both of their hands were outstretched slightly on their laps, as though waiting for something that would fit. She saw how they just kept missing each other – like how she’d come home on her birthday, just in time to see the blinking light of the answering machine flicker on. Take care of mom and dad, Mina remembered, and for a moment she could almost hear her sister’s voice. Then she was leaning forward from her spot in the backseat, into the space between her parents, pointing up at the windshield. “Look,” she said. Her parents looked. They held their positions in silence, chins tilted up, eyes open, watching as the eerie lights spread themselves across the sky, while Mina watched the softening of her father’s eyes, the way her mother’s mouth curled into a small smile. In their laps, their hands moved slightly, lessening the distance. For a moment, it looked like magic, and Mina willed it to stay – please, just this once. Then her father pointed, saying, “Hey, look,” and Mina saw a small shape far-off in the sky, among the stars. It was a plane, blazing a trail of snowy white, its lights flashing steadily. Like the blinking light of an answering machine. Like a miracle. “Think it’s your sister?” her mother asked, and that was a smile, a full one. Mina marvelled for a moment, at how something so small could change something so fast. Heat transfer, she thought, and she could feel it now, the warmth connecting the three of them. Maybe that wasn’t how chemistry worked, but it was how family worked. “Let’s go get her,” Mina said. Outside, the snow had stopped falling, leaving the night cool and crisp. In front, her parents’ hands met in the middle, and Mina grinned, bright as the silver lights in the sky. This is one of my favorite short stories ever. Excellent work, I hope to read more! truly the story was amazing. U deserve to be a winner Celina. Keep writing!! This is a really deep and beautiful story, Celina. You’re really, truly gifted and I hope that you continue to write! Though this story is short, it’s also memorable, and will stay with me for a long time. Congratulations on the win! That’s what my teachers would say. 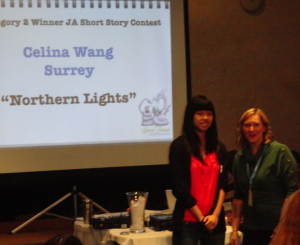 I love your story, Celina and I’m so proud of you. Your story reminds me of how moved I was to observe you with your sister at our piano recital. I had no idea you were such a gifted writer, along with being a gifted pianist. Keep writing. You have something very special. So proud of you Celina. You have a wonderful gift of writing….you always have. Congratulations. This is a wonderful story. While I was reading it, I could sense the deepness and how personal it felt. I love reading stories like this. Great job, Celina and keep writing.